Greetings and welcome to the Boston chapter of the Brandeis National Committee! Though our chapter encompasses the greater Boston area including Brandeis campus, this website serves the BNC Cape Cod chapter as well. This active group of lifelong learners aims to provide our members with fun, informative activities, and study groups while forging friendships, serving our community, and supporting Brandeis University. Every year we give our members opportunities to expand their interests and knowledge through lectures, special events, and study groups. There is something for everyone with topics ranging from cooking, to literature, to film and performing arts, to special tours, and discussion groups. In line with Brandeis’ life-long learning philosophy our programming is designed to be educational and fun. We hope you will take advantage of all the chapter has to offer, as it is a great way to spend time with old friends and make new ones. In addition to providing our members with exciting events, BNC Boston serves an important function by providing financial support to the Brandeis University libraries, scientific research, and student scholarships. While some of our members are Brandeis alumni or family of alumni, many BNC Boston members have no former relationship to the University. They joined BNC just because of their love of learning, philanthropy, community, and social justice. We hope our members will be inspired to find a way to give back: by joining a committee, directly donating to the University through one of its various funds, or by serving the community through one of our volunteer opportunities. We look forward to learning and growing with all of our members, new and returning, for another BNC year! 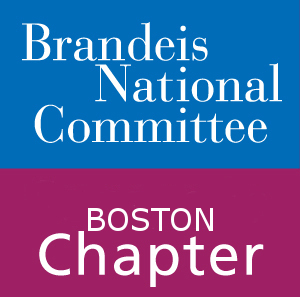 The BNC Boston chapter has the unique opportunity to directly interact with Brandeis more than other chapters due to our location. Our board meetings are held right on campus! Become a member today to immediately take part in our events and to start making new friends. All Rights Reserved, Boston Chapter of the Brandeis National Committee.